Amid protests outside the Palais des congres, CKUT journalists penetrated the Salon des ressources naturelles and spoke to the mining representatives who had gathered to sell their companies to new employees and customers. 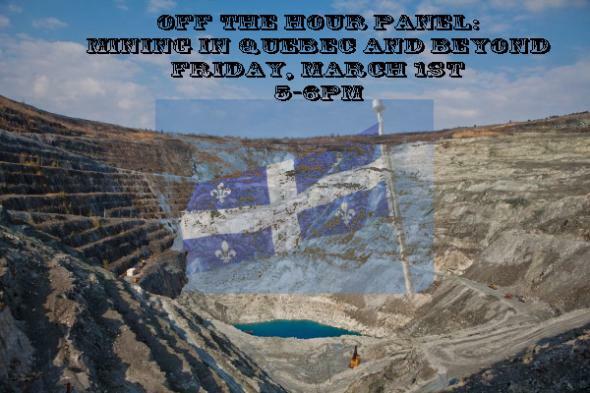 On this Friday’s Off the Hour, we bring you a special hour-long live panel discussion on the mining industry in Quebec and abroad, Aboriginal peoples title rights, post-Plan Nord and mining resistance. Tune in for clips of interviews from inside the Salon itself with commentary from Marie-Dominique Langlois from the Projet Accompagnement Quebec Guatemala (PAQG), Cleve Higgins from the Indigenous Solidarity Collective, and Pakesso Mukash, Cree/Abenaki/French Canadian musician, and activist. Listen to the podcast. Follow us on twitter @CKUTNews.